The Murrells Inlet Real Estate Market is heating up as more home buyers are finding Murrells Inlet is a great place to live. Who can blame them for wanting to be within blocks of the Murrells Inlet Marshwalk, Veterans Pier and great Murrells Inlet restaurants. The area real estate market is definitely heating up with new homes going up just in time for the spring buying season. New home listings in Murrells Inlet are certain to get the attention of buyers and the prime location of these Murrells Inlet neighborhoods should be part of any home buyers looking to purchase in the next few months. Hammock Point ~ Located on the Southern tip of Murrell Inlet with 31 home sites and eco-friendly pervious streets. New homes priced from $189,900 this new neighborhood is just a short bike trip to Huntington Beach State Park. Some homes offer some of the most pristine views of Murrells Inlet. HOA $60 per month. 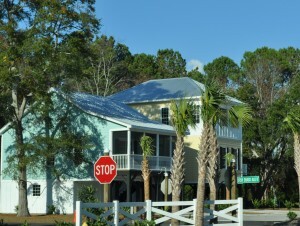 Murrells Inlet Village ~ Featuring new raised beach cottages starting at $169,900. Located on the south end of Murrells Inlet just off the bike path and across from Graham’s Landing. No HOA. Mallory Trace ~ New homes starting at $179,100 in the heart of Murrells Inlet. South Bay Village ~ New homes starting at $299,900 feature metal roofs, hardy plank siding, granite and hardwood flooring. HOA $69 per month. Located beside the Inlet Sports Lodge. Creekside Cottages ~ Located just 1 block from the creek and Murrells Inlet Bike Path and Public Boat Landing has several 3 and 4 bedroom new homes starting at $273,000. HOA $60 per month with a community pool. With over 200 properties on the market for sale in Murrells Inlet there is something for everyone. From condo units starting at $78,000 and single family homes starting at $69,900 call us today for help finding your Murrells Inlet home. Copyright©2013 Sandra Bundy, Broker-in-Charge, B&P, Inc. Serving the Grand Strand and Pee Dee South Carolina.